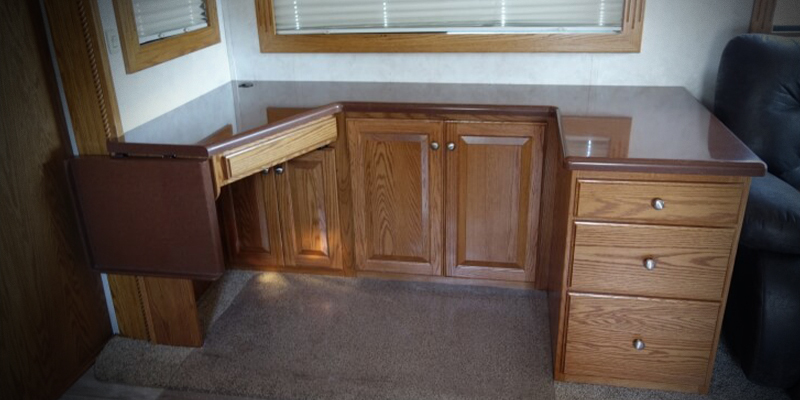 The section of features desks that we have built for special application and layouts. We specialize in building exactly what you want if it is possible to do so. Browse through the collection and get some ideas for your own special project. 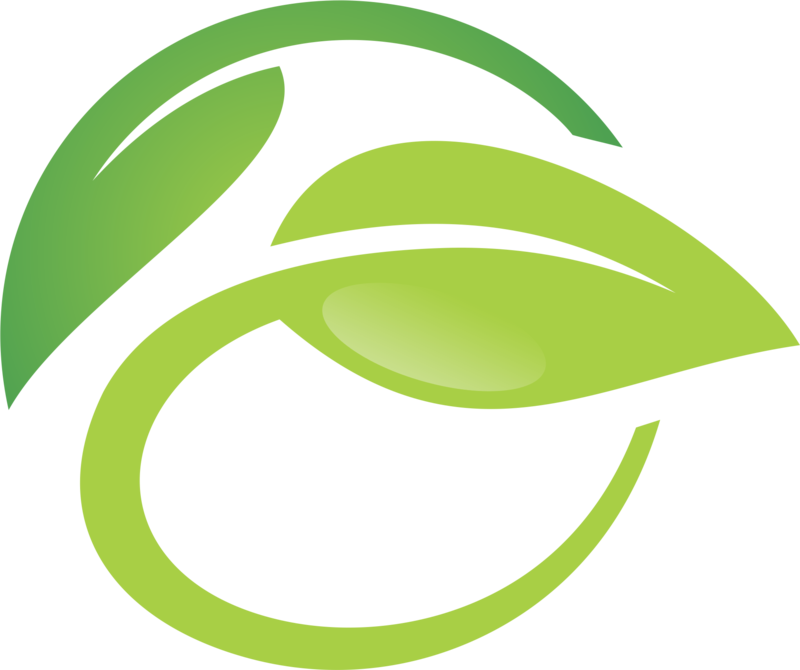 We will build your design or we'll help you start from scratch. Here is another highly customized desk that has many features built into it. 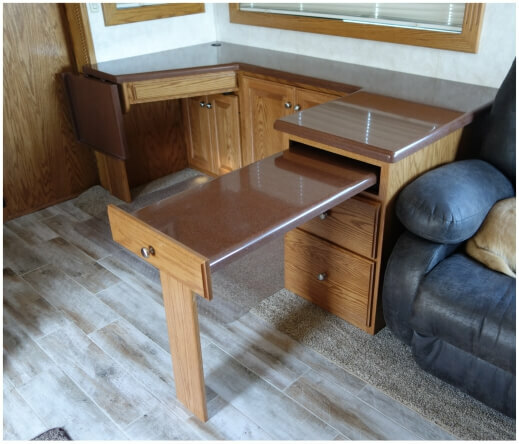 The customer wanted to replace a booth dinette with a functional desk to be able to work on the computer and store the printer and other desk items. So this desk was designed to accommodate all these things and more. 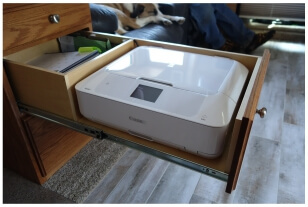 it features a pullout pencil drawer, a flip up end counter top extension, adjustable shelves for storage, a custom printer drawer, and a huge file drawer. Also, with eliminating the booth dinette, the table was eliminated as well, so we installed a pullout table with a drop down leg. 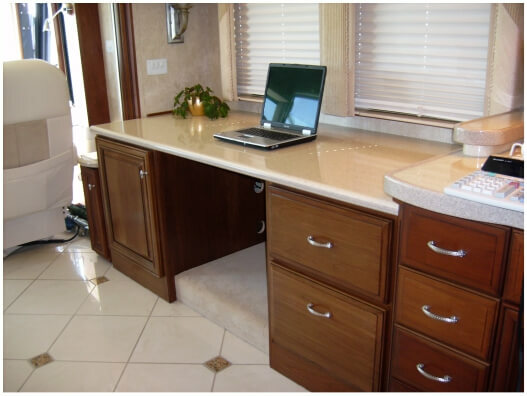 As can be seen in the photos below, each feature was built to match the customer's needs. The pullout table was mounted in the top drawer opening, and has a flip down leg that stabilizes it when it's out. This desk was built on an offset slide out. The owner wanted to be able to use a regular office chair with the desk but the offset prevented the chair from sitting level. So an extension platform was built and attached to the side front to allow for the chair to sit by the desk. The slide was then recarpeted to make it all look like one piece and finished out. This desk was built to fill an empty space left over by a sofa that was not needed. 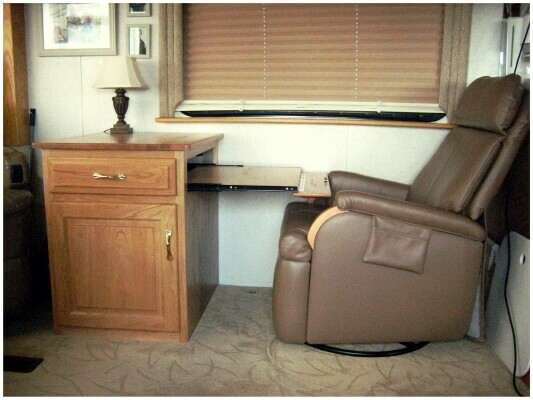 The slide was not floor level so the desk was built to accommodate the offset and still function for proper use. Finished in a hand glazed cherry to match the existing wood cabinetry, it made or a stunning transformation from the original layout. 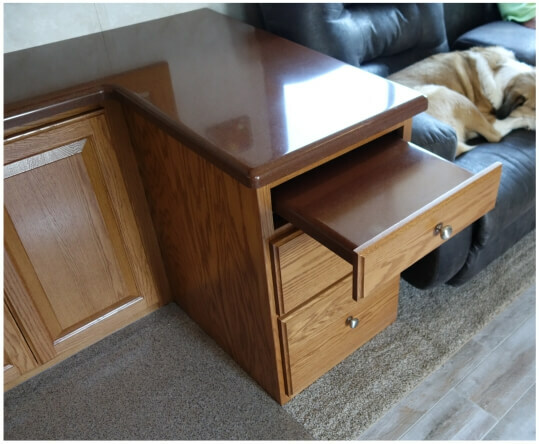 This was a simple little desk built for convenience and use without taking up a lot of room. It features a pullout laptop tray on the side and a pullout printer tray in the front. 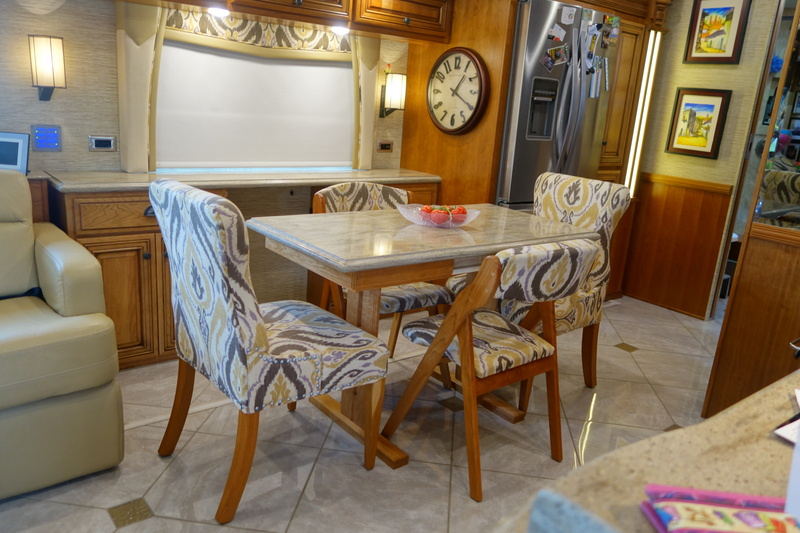 The beautiful hardwood top finishes off the design and makes it look like it came with coach originally.